Viton® O-Rings are standard with optional Buna N, EPR and Kalrez®. 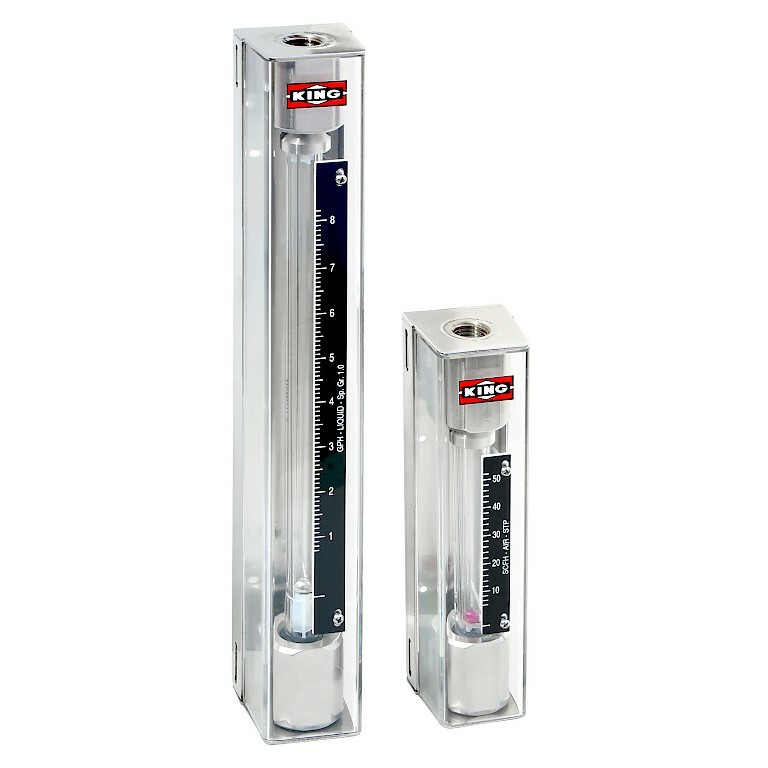 The 7440 series flow meter is available with either a 65mm or 150mm scale and is suitable for both liquids and gases. All models have a 10:1 turndown ratio with 1% repeatability, accuracy varies by model but this is within a ± 4% (for 150mm scaled version) to ± 6% (for 65mm scaled version) of full scale. Maximum temperatures are available up to 93° C for liquids and 121° C for gases, with pressures available up to 13.7 bar. Liquid models are available with full scale flows from 0.75 CC/Min to 1800 CC/Min (0.042 litres per hour to 110 LPH). Gas models are available with full scale flows from 66 CC/Min to 70000 CC/Min (4 litres per hour to 4200 LPH). Scales are available in any volumetric unit and optional alarm switches which include a Fiber-Optic NPN or PNP (Proximity) or inductive ring sensor (Proximity or Latching). View the complete range of King Instruments rotameters.